God’s amazing grace is displayed as He vows to strive with the wicked antediluvians for 120 years. Throughout this probation period, His faithful servant, Noah, pleads passionately with them, but God’s great heart grieves as He watches Noah’s family walk into the ark, alone. Noah finds grace in God’s eyes as the result of an extremely close relationship. Genesis 6:9 says, “Noah walked with God,” a phrase used only one other time in the Bible, to describe Enoch (Genesis 5:24). The emphasis of this story is not on the wicked—it’s upon righteous Noah, “For the eyes of the Lord are on the righteous, and His ears are open to their prayers.” 1 Peter 3:12. 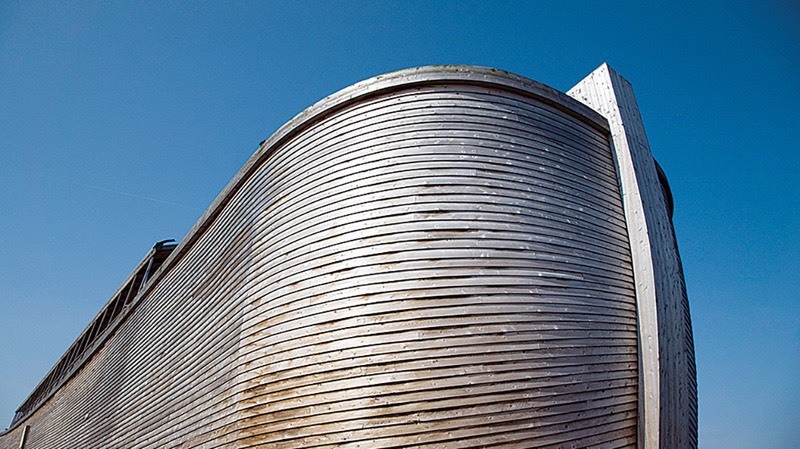 The ark was to be made of gopher wood (probably cypress) that would resist decay for centuries. It would have many rooms for animals and people, be covered with pitch or resin, and be approximately 450 feet long, 75 feet wide, and 45 feet high. The wicked are stunned into silence as the long procession of animals walk past them into the ark! However, after the Lord closes the door, and nothing happens for seven days, they’re convinced of Noah’s lunacy. But although they mock him, God will not be mocked! After seven days, the skies turn black with rain and the vast “fountains of the deep” break open, shooting up into the sky! Above the noise of thunder and rushing waters the terrified cries of man and beast can be heard as they trample each other, seeking higher ground. What a sad end to God’s beautiful world. Notice the very specific numbers mentioned in Genesis 7. God is undoing His Creation, returning the earth to its original state of watery chaos. He does so by destroying all the air-breathing creatures with rain for 40 days and nights. A careful study of the number 40 in the Bible reveals that it’s often associated with bad times: TheIsraelites wander in the wilderness for 40 years as punishment for refusing to obey God; Moses lives in exile for 40 years after killing an Egyptian; then, while he was on Mt. Sinai for 40 days, the Israelites thought they had lost him. Elijah fasts for 40 days as he flees Jezebel’s wrath, and Ezekiel suffers 40 days of punishment for the sins of Judah, while the people suffered for 40 years. In the New Testament, Jesus endures 40 days of fasting and temptation, and later spends 40 days on earth after His resurrection, calming the disciple’s fears of being abandoned. Genesis 7:24 brings us another significant number: “And the waters prevailed on the earth one hundred and fifty days.” This 5-month period was a familiar number for the ancients: It is the time between the planting of grain and the end of the harvest. During the flood, God completes the harvest of the wicked—a point that Noah and his family certainly must have understood. However, the Bible says, “God remembered Noah, and every living thing, and all the animals that were with him in the ark.” Genesis 8:1. The God of the Universe is totally focused on a tiny ark floating on the violent waves—what tender mercy and personal attention He shows His creatures! In fact, the word Elohim, or Lord, is used throughout Genesis 7—a name used with the covenant of salvation, indicating intimate relationship and mercy. As a reward for his righteousness, Noah and his family are now the remnant who preserve the righteous line and human life on this planet—even as God prepares to start over.